JOHN KEITH RASH, of Branson, Missouri, was born on December 8, 1960 in Asheville, North Carolina, son of Gerald Dean and Mary Lee (Fox) Rash. He departed this life on Friday, February 1, 2019 in Golden, Missouri, at 58 years of age. He was a graduate of T.C. Roberson High School in Asheville, North Carolina. 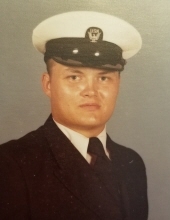 John retired as a Master Diver and Petty officer first class from the Navy. He then earned a master’s degree in aquaculture from Auburn University and did further graduate work in food science at the University of Arkansas. He worked at the Branson VA Clinic as an advanced medical support assistant. He was a member of the Traditional Latin Mass Community at St. Joseph’s Catholic Church in Tontitown. His interests included the outdoors, fishing, traveling, chess, and commodity trading. On September 5, 1986, he was united in marriage with Imelda (Aimee) Dacuya Conde, who survives him. He is also survived by his daughter, Mary Otilia Rash from Rockhampton, Queensland, Australia; his parents, Gerald and Mary Rash of Berryville; his brother, Jeff Rash and his wife Vicki of Seymour, Missouri; and his many nieces and nephews in the United States and the Philippines, including niece Shirley Rash of Berryville and nephews Arthur Rash of Berryville, Jovan Conde of Lowell, and Royce Barba, Jeff Barba, and Staff Sergeant Christopher Barba of Long Beach, California. He is also survived by many aunts, uncles, and cousins in North Carolina. To send flowers or a remembrance gift to the family of John Keith Rash, please visit our Tribute Store. "Email Address" would like to share the life celebration of John Keith Rash. Click on the "link" to go to share a favorite memory or leave a condolence message for the family.